Gabriel Arias, SS, Padres (Fort Wayne) – Still just 18, the slick-fielding, 6’1″ shortstop has all the makings of an impact player. Arias turned in a 5-for-6 performance last week, in which he hit for the cycle – topping off an excellent August where he slashed .289/.352/.544 with 4 HR and 21 RBI. He’s definitely held his own in the MWL, but needs to address his inability to make consistent contact. As soon as he remedies that situation, he’ll wreak havoc on pitchers at each stop in the minors. Ronaldo Hernandez, C, Rays (Bowling Green) – Hernandez’ 21 home runs ranks second in the MWL, while his 15.4% K Rate and .339 OBP reveals that he’s much more than an all or nothing hitter. That’s a great sign for a 20-year-old in Low-A. His arm is regarded as one of the best among minor-league catchers and has shown enough skills behind the plate to project at the position long-term. It’s realistic to expect a mid to late season 2020 debut in the majors at his current pace. Jose Soriano, P, Angels (Burlington) – The 19-year-old can be best described as electric at times, as his fastball has touched 97mph on several occasions this year. Evaluators are enamored with his fast arm action and projectible body and most believe that triple-digits are in the near future as he makes his way through the Angles system. His major issue thus far is his frequency to lose the strike zone, but with most young power arms, this is a common occurrence. His 8.20 K/9 seems a little on the low side for facing Low-A hitters, but as mentioned above, his lack of control at times produced a miserable 6.83 BB/9. His raw arm strength alone will earn him plenty of patience, as evaluators are aware of the amount of work that awaits the young right-hander. Nolan Gorman, 3B, Cardinals (Peoria) – The ceiling is high and the potential is massive for the 19th overall pick in the 2018 draft. Gorman slugged his way through rookie ball, raking his way out of Johnson City just in time to finish the last month in Low-A. All he’s done is tally 6 HR in his first 24 games in Peoria. Those power numbers will play. No reason to worry about the low average (.209) or his spike in strikeouts (42.7% K) just yet, as he’s just two months removed from prep baseball. His raw power is something evaluators dream about as he carries a 70 grade label when he steps into the box. His defense will be monitored closely, but there’s no reason to believe that he won’t receive a full trail at the hot corner before any decisions are made. In his fourth game since a promotion to @peoriachiefs, #STLCards No. 3 prospect Nolan Gorman (@NolanGorman) caps a three-hit day with a go-ahead RBI single. 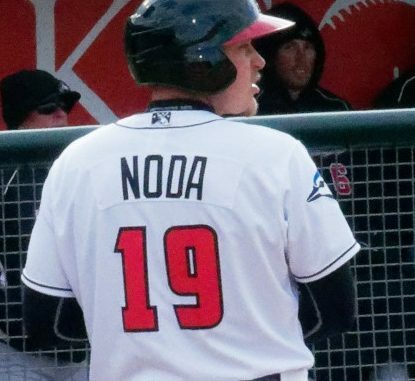 Ryan Noda, 1B, Blue Jays (Lansing) – Despite the fact that he’s a 22 year-old power bat in Low-A, which is older than the typical prospect at that level, Noda has slugged and walked his way to the top of the Midwest League’s offensive categories this season. Baseball America labeled him as having the best strike-zone judgement in the MWL, which would explain his 20.8% BB Rate. His 167 wRC+ shows how much of a legitimate force his bat can be and his 20 home runs this year might be a sign that he’s finally tapping into the raw power that scouts raved about during his time at The University of Cincinnati. Gerardo Carrillo, P, Dodgers (Great Lakes) – Physically, when you first lay eyes on the 19-year-old right-hander, you might wonder if you have the right player in your sights. Carrillo stands 6’0″ tall,(maybe) and weighs in at 150 pounds. The moment he unleashes his fastball, you realize that this skinny-framed kid is exactly who you’ve come to see. His arm action is exceptionally quick, creating such easy velocity it seems like he’s playing catch. His fastball sits in the 93-95 range and can jump up to 98 a few times each start. Across nine starts in Low-A this year, Carrillo produced an elite ERA (1.65) and WHIP (1.02), while allowing no more than three runs in any of those contests. Jeisson Rosario, OF, Padres (Fort Wayne) – Perhaps the only critique we can make in Rosario’s game this year is his tendency to swing and miss too much. His 20.8 % strikeout rate isn’t the worst in minors by far, but for a player with the hit tool capabilities of Rosario, that number should be much lower. In his defense, he does have an elite approach at the plate for an 18-year-old, as his walk rate (12.8%) ranks 8th in the MWL. He’s swiped 18 bases on the year, giving evaluators the assurance that the power/speed combo that he’s flashed at times is still mostly untapped.